"A fine example of best early nineteenth century English Regency porcelain from one of the principle makers of quality antique ceramics. This well potted Regency Derby large breakfast cup and saucer was produced around the 1800s by the Derby partnership of Duesbury and Kean. 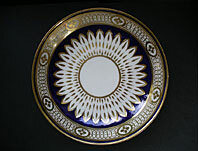 The Mazarine Blue and Gold Sunflower pattern is a revival of the earlier 18th Derby patterns from circa 1785. The elegant hand decoration in gold in neo-classical style with Vandyke border produces an exquisite result against the mazarine blue bands. It is unusual to find a surviving Derby porcelain breakfast cup and saucer in such wonderful condition. A super example of early 19th century English porcelain for the discerning antique English porcelain collector." Antiques Expert Hamilton Bear. 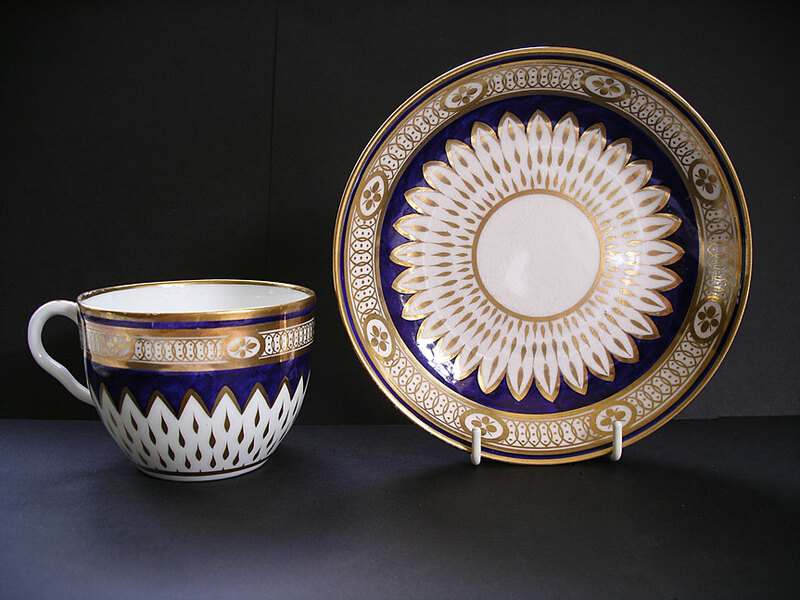 References: See section Derby Porcelain 1748-1848 An Illustrated Guide, John Twitchett plate 229 pg 236 for a near identical example of this pattern on a 1790 sucrier. Dimensions: height of cup 68 mm max. width saucer 158 mm max. Marks: Derby marks to both pieces as illustrated. Condition: Both pieces are in excellent condition with no restoration or damages to porcelain. Gilded pattern is first rate. There are minor traces of rubbing wear to saucer and typical clear fine grazing to glaze; patches of rubbing wear to inside edge of gilt rim to cup. Overall a great set.